Ready Set Woof is a fun and very simple game designed for kids where you'll be shaking the dog bowl randomizer and attempting to find the correct dog to give it a bone before your opponent does. If you can, and successfully find five dogs first then you'll win. Dog games are fun and relate well to other people. Kids will have a blast with this down to earth game where there is no strategy - just luck and speed. 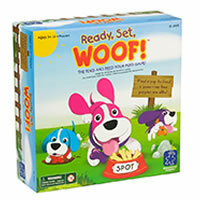 Ready Set Woof helps get kids interacting with each other and having fun at the same time. You'll be happy you picked up the game Ready Set Woof. The first player to get rid of all five dog bones by finding five correct pups is the winner. You'll get a game board, a dog bowl randomizer, 20 dog bones and the official Ready Set Woof game rules and instructions. Please keep in mind that the official Ready Set Woof childrens rules and instructions could be different depending on the game version you have. The rules below are some of the exact directions on how to play Ready Set Woof. Share with us your comments, funny stories, tips, advice, strategies, creative ways to play, questions about how to play, problems with the rules or anything you want about Ready Set Woof. All submissions will be reviewed within 24 hours. Click here to add your Ready Set Woof comments.